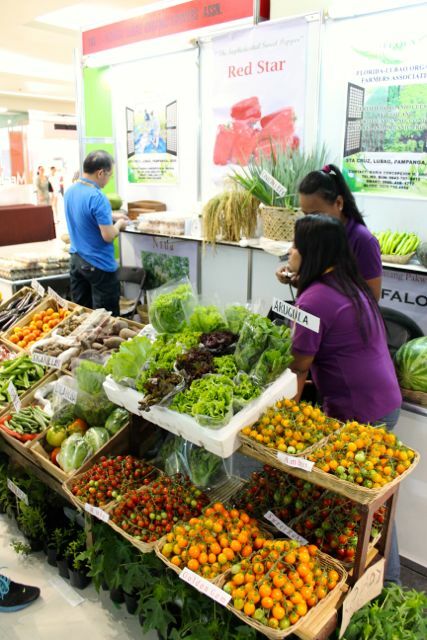 At this organic stall from Pampanga, a beautiful selection of capsicum, cherry tomatoes, and other organically grown vegetables. I wish these guys had a regular stall at a weekend market. Beautiful stuff. But capsicum and tomatoes not for sale. Bummer. I guess folks like me would have wiped out their stocks in the first hour and there would be nothing on display. 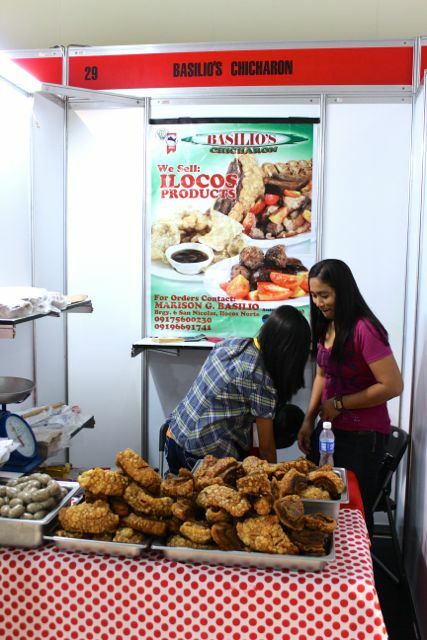 The produce offerings in Manila and surrounding provinces is really getting broader and more interesting. 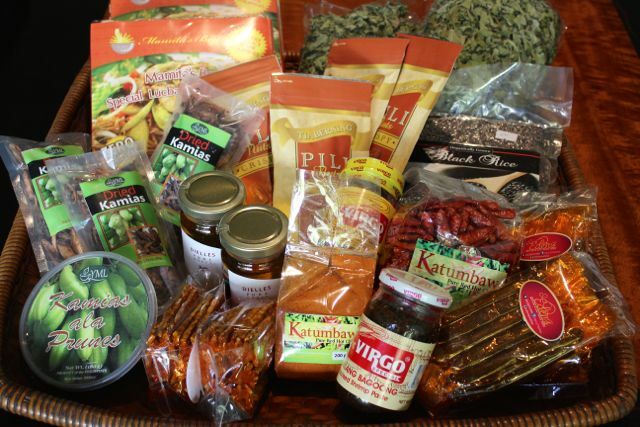 …I bought several forms of dried chilies from Mindanao, along with black rice and other organic products from small individual manufacturers or cooperatives of farmers. It was just a few minutes after ten when I got to the show, so everyone was still setting up (why they can’t be ready at 10 is truly beyond me) so I didn’t quite get as much information from vendors as I was hoping to… In fact, I got more “wala pa yung may-ari” (owner isn’t here yet) or “hindi ko alam yung presyo” (dont know any of the prices) or “walang barya” (I don’t have any change) or “calling card? wala po” (we don’t have calling cards/brochures) than you can imagine. So here’s some unsolicited advice for the wonderful folks who bother to take out a stall at a fair like this. 1. Man your stall with people knowledgeable about your products and who can answer perhaps the 50 most commonly asked questions 2. Always have a surfeit of calling cards/brochures so people can contact you to BUY your products 3. 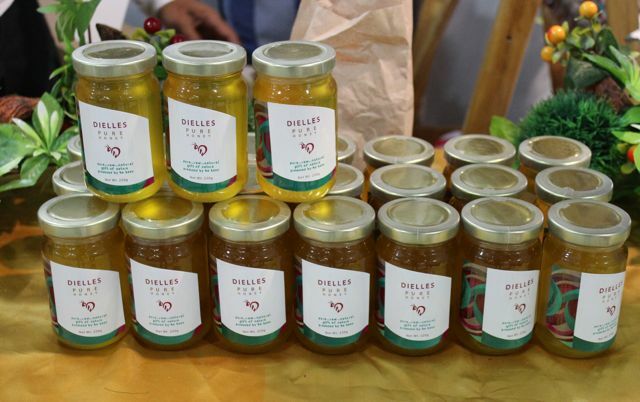 Have accurate and descriptive price lists handy (not small and large bagoong, but 200grams vs. say 400 grams) 4. Have change if you plan to sell goods 5. Be ready to deal with potential wholesale buyers, those are the guys who will probably do more for your long-term viability than a bunch of retail customers. 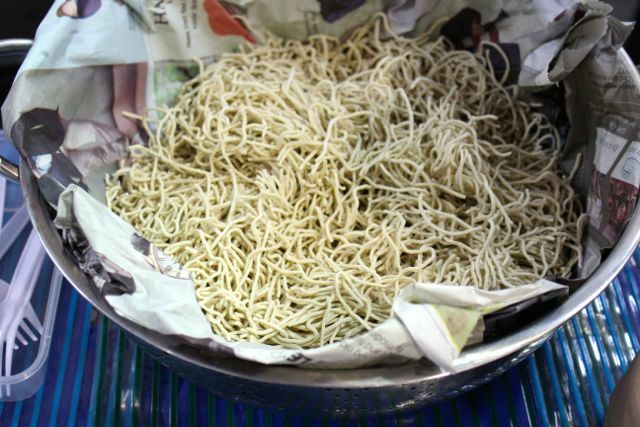 I bought a kilo of fresh miki from a pansi cabagan stall, but it smelled quite heavily of ammonia, or whatever chemical noodle manufacturers tend to use, and took a recipe for how to prepare it at home. 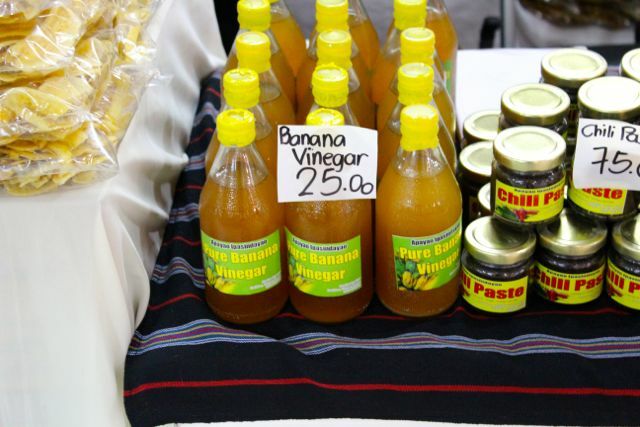 I was searching high and low for nipa vinegar, which NONE of the 70+ stalls seemed to have, but they did have banana vinegar, duhat wine, etc. It really is beginning to upset me that classic delicious vinegars are disappearing from the market… in the same way that so few artisanal patis makers remain… so much of the bottled patis in the groceries are now being imported from Thailand! Had to get a few pieces of bagnet to add to the pancit. Their chili chorizos are delicious. A bit sweeter than I personally like my sausages, but the combination of sugar, abundant chili, a nice meat to fat ratio, a stint in the “smokehouse” to get some smokey flavor along with a proper pellicle or texture to the skin that is slightly dried out, was very appetizing. The crew devoured the chorizos with glee. I added them to some pancit, in addition to eating them with some vinegar and rice. We also got some beef bacon, but haven’t tried it yet. Chino’s prices are incredibly good as well. 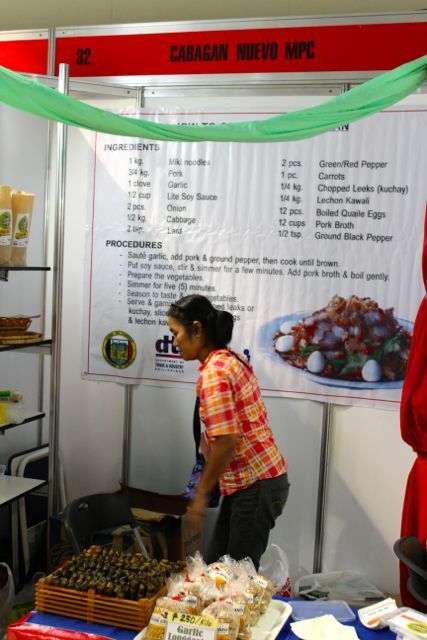 Overall, a very worthwhile visit to the fair of Filipino food producers. You might want to drop by if you enjoy these kinds of events… Admission is free. MM, I can almost taste the chorizos. You take wonderfully tasty pictures. Wish I could be in the Philippines to see and buy some of the goodies. 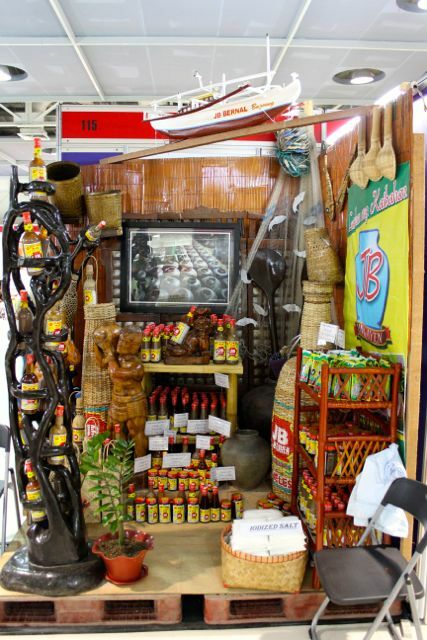 MM, you can get nipa vinegar from Paombong, Bulacan. I’m not sure if it’s available in the metro as well. The sukang paombong in the grocery doesn’t seem “authentic” at all, it tastes weird. Paombong, yes. They have the suka in huge earthen jars. Sometimes may kasama pang kiti kiti. I use pangasinan or balayan bagoong instead of patis. Patis nowadays parang water with salt. Rafael and Nessa, yes, paombong one good source, though not readily available in Manila. There used to be nipa vinegar all over the Visayas as well, and I can’t find a steady supply of that either. nice! i’ve been looking for old-fashioned vinegar too. nothing beats sukang sasa (nipa) or paombong as dip for steamed shrimps, crabs, oysters..it just makes the seafood sweeter without losing its seafood flavor. i find that a lot of so-called sukang tuba (coconut vinegar) is mostly synthetic. i don’t even bother buying local patis brands because they all taste like water with salt. i haven’t found a really good local brand. there’s a delicious fish sauce in bicol that the locals call “patis bicol”, but it’s actually more of a thin guinamos or bagoong isda, much like bagoong balayan. mm, off topic, saw you on TLC today with Chef Bobbie Chin, made me smile! Hi MM, were the dried chilis you bought the siling haba? So that they can be used for Malaysian curry or rempah? The aroma of the miki comes from the use of alkaline or lye I believe. Hello, MM, so glad you wrote about this — I rushed to Megamall as soon as I read your post. Go back? The humongous capsicum from Benguet sold for 200 pesos/kg. GT, I think I may know where MM bought his dried chilies. There were two kinds I saw, siling labuyo/kulikut and the larger kind they called hybrid. Both kinds were sundried so you can use for cooking or plant the seeds. Brandname Pablo. 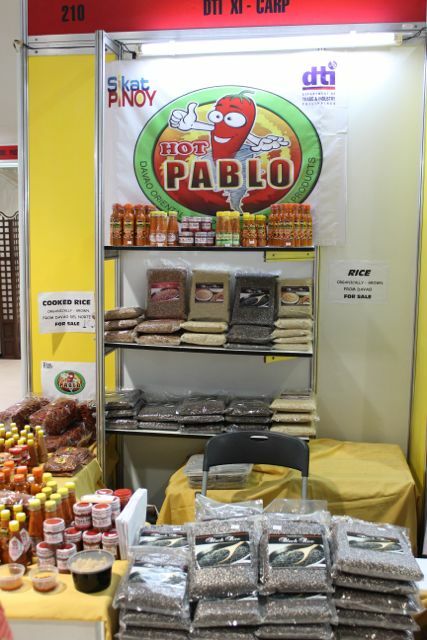 The vendor from Mindanao came from one of the communities affected by supertyphoon Pablo in 2012 and said the government had encouraged them to plant chili because ready to harvest in three months. MM, I am interested in the black rice you bought. I have a bag of it from Thailand which I tried once before to cook like sweet guinataan but turned out to be a failure. Would appreciate a recipe for what you’ll make out of it. Maybe a suman? Thanks! To Malou: The black rice is not ideal for guinataan or suman as it is not glutinous. It has a more nutty taste to it than white rice and in the US, it is priced as an “exotic” rice. Nevertheless, there are glutinous black rice (black malagkit) and again, here in the US, they are readily available in any Asian grocery/supermarket. For the regular black rice I cook it like white rice and pair it with adobo and some green veggies such as guisadong kangkong or spinach, and basically any green veggie of your choice. 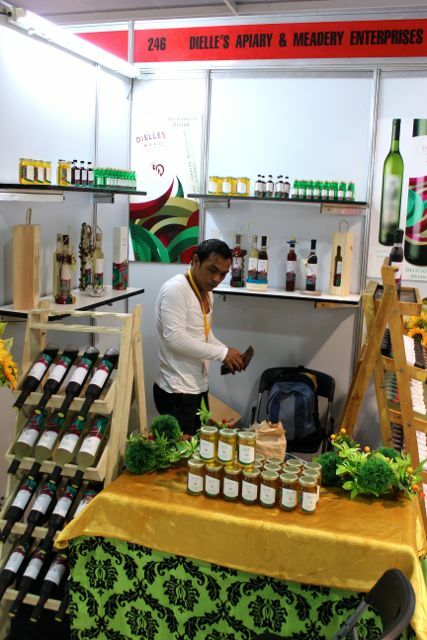 Locals can enjoy our own products. You are doing them a big favor, writing this post. Free adverstising for them! Did you have to take such a huge picture of the chorizo? I’m salivating here. Never seen such round small chorizos. Hopefully we get a good harvest of cashew this year so we can to participate in this food fair next year. The kiti-kiti Rafael Hocson referred to are actually naturally occuring bateria that helps in the fermentation process of the nipa vinegar. Microscopic in size, you can only “see” them when a bottle of Paombong vinegar is held against the light, then one can see these “kiti-kiti” swimming at the surface of the liquid. Many people throw out Paombong vinegar when it changes color thinking it got spoiled. Truth is, the changing color is an indication that the vinegar is continuously fermenting. Left untouched/ummoved, the Paombong vinegar will change from cloudy white to clear amberish color liquid. However, bottle of regularly used vinegar will start to change from cloudy white to murky-blackish liquid until it ends up in a clear violetish liquid. If your Paombong vinegar produces some gel while in storage, something very similar to nata de coc, it means some water had mixed into the vinegar. the pork bacon is yummy, based on the sample i got, better than pf! it was P245 for 500g. so i bought that and passed on the chorizo. betcha the others asking about the chorizo (the guy said he had only one pack of it left) were also mm readers. hihi. 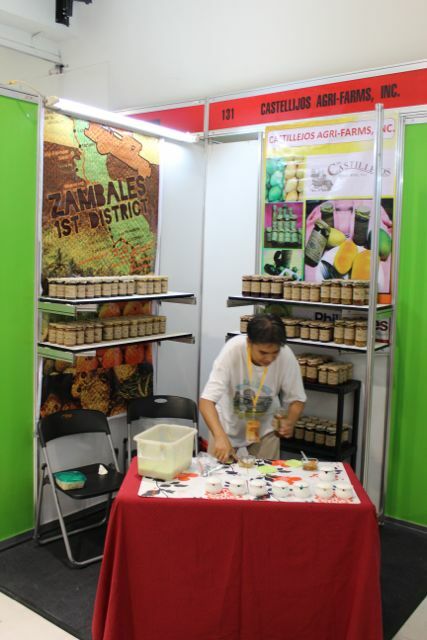 As a visitor from Canada the trade show provided an excellent source for pasalubong to take back to Canada. I couldn’t get enough of them! 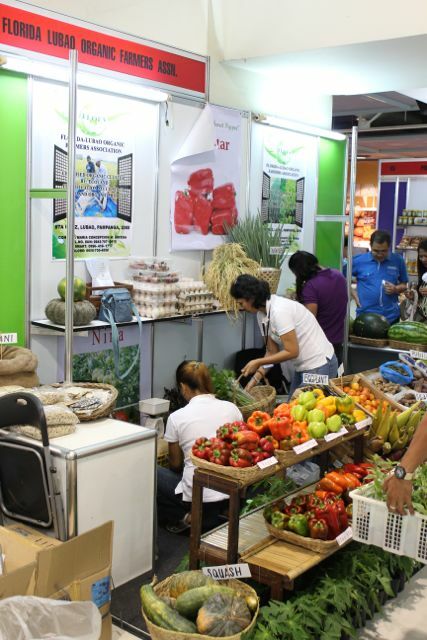 Next week there’s another similar trade show in the same venue exclusively for Visayas, particularly those hit by Yolanda, which gives me more reason to go back and buy some more! I follow your blog and would have been thrilled to have met you there. The smoked chorizos as well as the ham were really good too bad it’s already sold out when I came back. 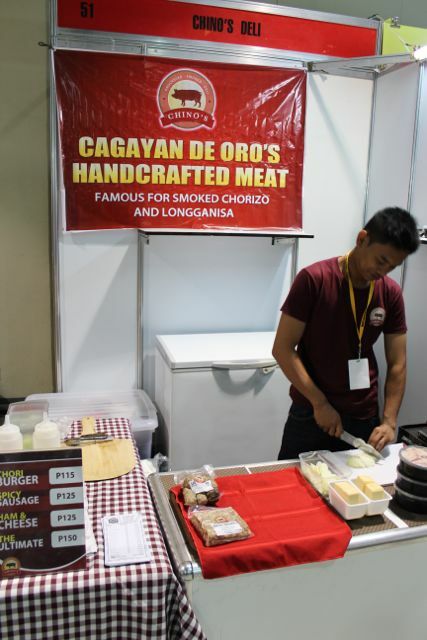 I did a google search for Chino’s Deli and saw that they’re located at Cagayan De Oro, will definitely go to their shop once I go on a vacation to CDO. Sadly I cannot buy sukang sasa anymore since I left my job in 2010. I get it from my officemate who lives in Baliuag, Bulacan. 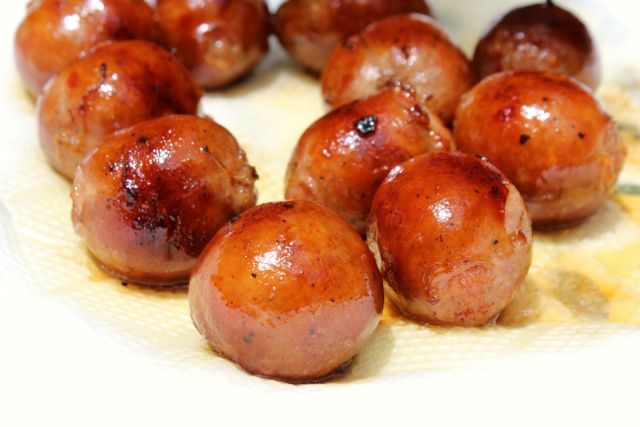 Ang sarap pa naman… espcecially for inihaw na liempo and adobo dishes. I also bought kamias ala prunes, it’s currently a favorite at home.